Same as some of the best and most expensive watches in the world these watches are completely mechanical and made up of many tiny precision engineered parts. Often referred to as “self-winding”, automatic movements harness energy through the natural motion of the wearer’s active wrist. As long as the watch is worn regularly, it will maintain power without requiring winding. Seiko made their first automatic in 1895. Some models have movements than can also be hand wound from the crown, this is useful if you don’t wear the watch every day. Automatic watches beat very fast and have the “sweeping” seconds hand rather than “ticking” hand of a quartz watch. 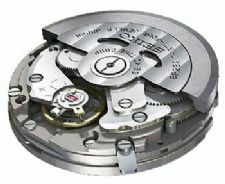 An automatic movement works largely the same way that manual movements do, with the addition of a metal weight called a rotor. The rotor is connected to the movement and it can rotate freely. With each movement of the wrist, the rotor spins, transferring energy and automatically winding the mainspring. Automatic watches are never as accurate as a battery model but they are the true original and traditional movement in a watch. Spare a few minutes to watch the amazing video below. Shipley, BD17 7AD Yorkshire, England.